Have you ever eaten at a restaurant and then come home only to want to try to recreate something you ate? Well, that’s what we’re doing today. This past June, while I was visiting Savannah, Georgia, I ate at a really fun restaurant called Treylor Park. You may remember Treylor park from our Where to Munch Savannah article in which we shared some of our favorite eats. At Treylor Park, we enjoyed PB and J Chicken Wings, Avocado Fries, Hamburger Tacos, and the Apple Pie Sandwich. All of it was so delicious, I’m tempted to fly back to Savannah just to eat at the restaurant. Of course, we all love a good “dupe” recipe, so I decided rather than buying a plane ticket, I would try to recreate one of the dishes that I so enjoyed. Following is my attempt at the Treylor Park Apple Pie sandwich. I’ve made a few refinements and in the end come up with a sandwich that, if not quite the Treylor Park version, is still pretty darn tasty. Treylor Park serves up southern comfort food with a twist. Today, we are going to add a few twists of our own to this innovative sandwich. The original apple pie sandwich consisted of cinnamon roasted apples, cheddar cheese, and bacon on brioche bread. The sandwich is served with house-made potato chips for $9. While I really enjoyed the sandwich, I wanted to make it a little more like an apple pie. To that end, I chose to use croissants instead of brioche, which will give the sandwich that crispy and flaky feel, similar to a pie crust. And, instead of cheddar, we will use brie because for its creaminess and slightly sweet flavor. Our sandwich comes to about $5.15. Watch us make the Apple Pie Sandwich below and scroll further for the detailed recipe! Using a mandolin or food processor, thinly slice potatoes. Let potatoes soak in salted water for 30 minutes. While potatoes are soaking, peel and slice apples. Toss apple slices in lemon juice. Melt (3 tbsp) butter in frying pan over medium heat. For added flavor, you may brown the butter by letting it cook until the cracking sound dies down and the butter takes on a brown hue. Be careful not to overcook. Add apple slices, sugar, cornstarch and cinnamon. Stirring occasionally, cook the apples for 5-10 minutes until they are tender and easily pierced with a fork. With a slotted spoon, scoop up the apple slices and move to another bowl. Drain potatoes and pat dry with a paper towel. Toss the potatoes with oil and salt. On a baking sheet covered in parchment paper, lay potatoes in a single layer and cook in the preheated oven for 18 – 30 minutes. If using an air fryer, as we did, I would suggest tossing the potatoes in oil as well. This would help the potatoes to cook more quickly, which they did not in our test. The original instructions said to cook at 170 degrees for 20—25 minutes, for us it took about an hour and the spuds still could have cooked a bit longer. We just got impatient and decided to move on. While potatoes are cooking, cook the bacon to your desired consistency, though we feel crispy works best for sandwiches. 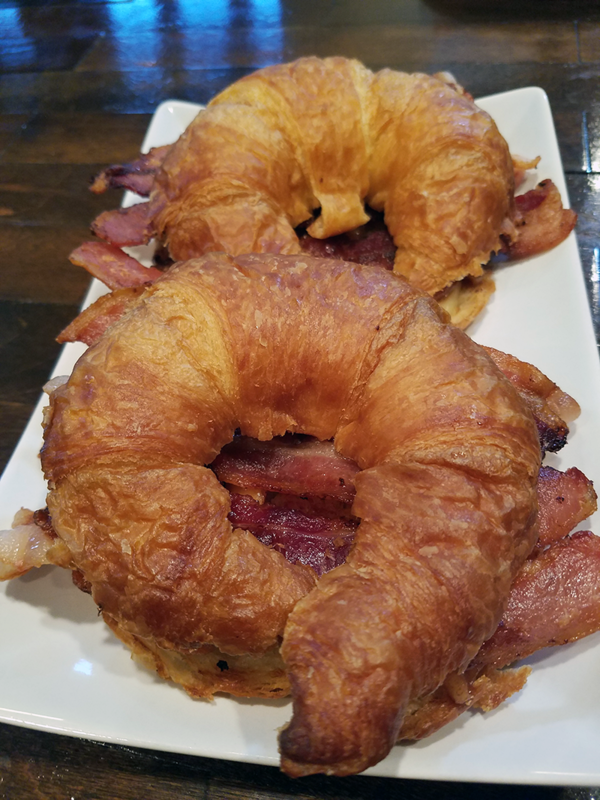 Toast the croissant in a large skillet or atop an electric griddle. First toast on the cut side, then flip to the opposite side, add cheese on the cut side. Allow the cheese to melt. You could also place croissants on a baking sheet, top with cheese, and bake in the oven for 5-8 minutes. (In the video, we felt we didn’t add enough cheese, so be sure to pile it on to make sure you get brie in every bite). After the bacon is cooked and croissants toasted, assemble the sandwich. Place a layer of the apple pie filling on top of the cheese. Add your bacon layer, add your chips to the side and serve up. Mission to munch accomplished! Did you accept the mission? If you make this recipe, please share it with us and tag @missiontomunch on Instagram and use #missiontomunch!